As the joke goes, a wife asks her husband about vacation plans, and he declares, "Honey, I'm taking you to a place you've never ever been to!" The wife gets all excited and pleads, "Tell me, tell me, where!" To which the husband replies, "I'm taking you to the kitchen!" My mom doesn't cook. In fact, she probably couldn't boil an egg. But she had a wonderful collection of cookbooks. The books were pristine, and still had that new-book smell, because they were kept in a special cabinet in her air-conditioned bedroom. No oil stains on the bookmarked pages, no scribbles of measurement conversions, no flour dust on the book rib. These cookbooks were loved, but from a distance. Whenever she purchased a set from a door-to-door salesman, the books were carried upstairs like a new baby, unwrapped and carefully tucked into the mahogany cabinet. I don't remember whether she ever looked at them again, but they were there for me. I would sit on her bedroom floor leafing through the pages of her Foods of the World cookbook collection and be transported to France, Italy, Germany. I imagined the creaminess of a Zabaione, or what the heck was so good about Oeufs en Gelee. Many years later, each time I would travel home to visit family, I'd take back with me whatever remained of the cookbooks. I still leaf through the books in awe of the wide world of food, but now the yellowed pages are stained and scribbled on and well loved. This is one of our favorites. Soak the pieces of bread in milk for about 5 minutes. Mash softened pieces with your hands until most of the lumps are smoothened out. In a bowl, combine softened bread, egg, minced beef, sausage meat, parmesan cheese, parsley, 1 tablespoon olive oil, garlic, lemon peel, salt and pepper. Knead the mixture vigorously by hand or with a wooden spoon until the ingredients are well blended. Shape the mixture into small meatballs. Lay on a baking sheet, cover with plastic wrap and chill in the fridge for 1 hour. Heat about 1/4 cup of olive oil in a heavy skillet. 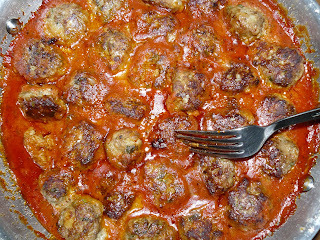 Fry the meatballs over moderately high heat, shaking the pan constantly to keep from sticking to pan. Cook for about 8-10 minutes. Serve with favorite tomato sauce over preferred pasta. 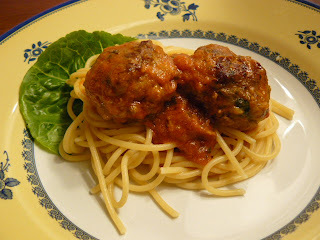 These look great - I love Italian food, and meatballs are a real favourite. Hi Sue, these are really delicious, hope you try the recipe. I should make these and skip the trip to the Olive Garden for their meatballs. I think you'll be pleased you did, Mary! This sounds so good! All your recipes are delightful and they make my day just looking at them, seriously. When I have time I'll tell my mother to try one your recipes. Maybe you should try making some indian dishes, like pakoras, or naan bread with a sauce!! I just love indian foods now since I've had them recently. -your good relative with the initials of your dad. Hello Ms Anonymous! Ask our mom to check out the recipe for Prawn and Squid Moilee when you feel like having Indian for dinner.